Retractable screens replace traditional screen doors. A Retractable screen door is perfect for homeowners who want to take advantage of natural cooling techniques but do not like the appearance of a traditional screen door. Retractable screen doors function like vertical roll-up blinds. When they are in use, a piece of screen stretches across the entire door opening. When they are not in use, the handle slides to one side and the screen rolls up into a cylindrical housing unit until it is needed again. A metal frame that is installed on the outside of the door adds stability to the screen without much visual impact. When the screen door is retracted, you should not even notice it is there. There are two main advantages of a retractable screen door that makes them attractive to homeowners. A retractable screen should not be noticed when it is not in use. The only evidence that you have one installed are the tracks around the door opening and the housing for the screen. The cylindrical unit that holds the screen and the surrounding tracks can be further camouflaged by the addition of some molding or paint to help it blend in with the exterior of the home. Other screen doors may not be appropriate for a small space, but a retractable screen requires little room. The track is normally about two inches wide, and it contains all of the parts of the screen door. 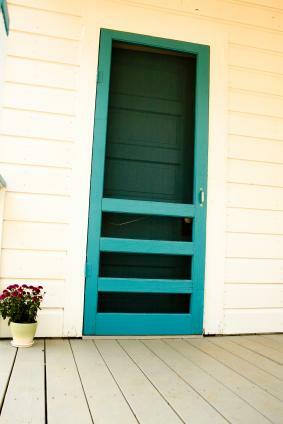 Unlike a traditional screen door, you do not have to take into account the swing of the door when it is open. Considering the ugliness of many traditional screen doors, you may be surprised that retractable screens are not more popular. However, there are a few problems with these screen doors that have many homeowners reluctant to install them. Retractable screens have more movable parts and more things to adjust if your door stops functioning properly. The problem is often more difficult to detect and may require you to take apart the entire door. The track that the retractable screen uses can also be a tripping hazard, depending on how it is installed. The modified installation that minimizes the chance of tripping on the track does not work for all exterior doors. Most retractable screens do not have the durability of a traditional screen door. The screen is made of fiberglass and is constantly under stress from rolling and unrolling every time the door is opened. Once the screen is torn or begins to rot, the entire door must be replaced. This is in sharp contrast with a traditional screen door, which can be repaired with a kit available at any Home Depot or Lowe's Home Improvement Store. Retractable doors are difficult to operate when your hands are full. The handle of the screen door is usually very small in order to blend in with the door, this also makes it harder to open than a traditional screen door. The door must be opened and shut slowly to maintain the functionality of the door. People who consider a retractable screen door often do so because they believe that all screen doors are ugly. While many traditional screen doors may not fit your aesthetic, there are hundreds of screen door styles available today. These doors are made from metal or wood and come in a variety of styles, ranging from contemporary to classic options. Exterior home renovations often begin by adding or updating a screen door, not removing one. If you do decide to buy a retractable screen, make sure you have a reputable professional install it. A good contractor can mount the track to minimize the tripping hazard it creates, as well as make any necessary adjustments to fit the exterior door.